Even the most carnivorous friend will be distracted by the delectable flavours in this mouthwatering, meat-free meal. 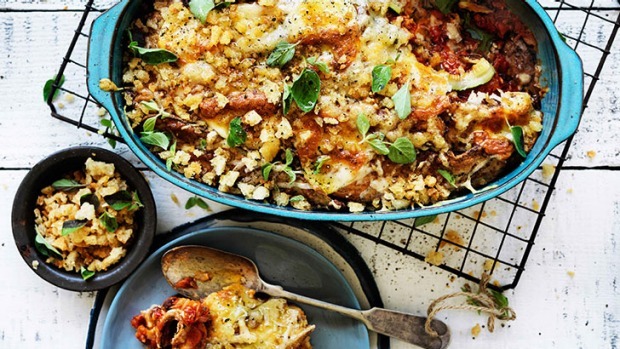 Alternatively, this parmigiana is great with roast beef or chicken as a side dish. In a frying pan, heat 2 tbsp extra virgin olive oil on a medium heat. Add onion and salt and sauté for five minutes. Add 1 tbsp of garlic and continue to cook until caramelised, then add the diced tomatoes, 2 tbsp oregano leaves and pepper. Reduce heat to a simmer, and cook until tomatoes break down and sauce thickens (about 20 minutes). Set aside. Whisk together milk, eggs, a pinch of salt and a grind of pepper. Place flour in a shallow bowl. Heat some oil on a medium heat in a large frying pan for shallow-frying. Working in batches, lightly flour the zucchini slices, then dip in egg mix and fry each side until golden (about a minute each side). Drain on paper towel. Preheat oven to 180°C. Brush some oil on the inside of a 2 1/2-litre baking dish. Layer some of the tomato sauce mix on the bottom, top with a layer of zucchini, then with layers of parmesan, mozzarella and basil. Repeat until all ingredients are used, finishing with a layer of cheese. Bake for 40 minutes or until golden. Process bread and remaining garlic together to form breadcrumbs. Heat 1 tbsp extra virgin olive oil in a frying pan and cook crumbs over a low heat until golden and crisp, set aside to cool. Stir through remaining oregano. Garnish dish with crispy breadcrumbs and serve.